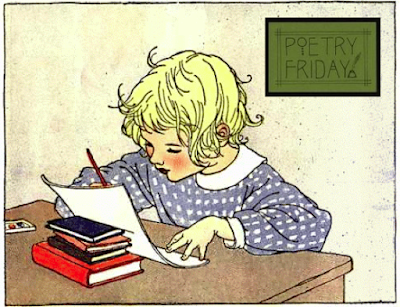 If you're new to Poetry Friday, have a look HERE to find out what it's all about. I'm looking forward to making the rounds of this week's offerings! At Today's Little Ditty, I've been sharing "ME poems" inspired by Lee Bennett Hopkins' Ditty of the Month Club challenge. According to Lee, a ME poem is based on "one simple moment in your childhood – a thrilling moment, a sad moment, a moment that changed you in some way." Like the little girl in the picture above, I imagine all the children in these poems sitting down to write about the special moments that helped shape their future selves. This week I featured poems by Linda Mitchell, Michele Krueger, Ellen Leventhal, and Kristi Dee Veitenheimer. Today it's my turn. Believe it or not, next Friday I will be posting the end-of-month wrap-up. If you'd like to participate, please send your poem to TodaysLittleDitty (at) gmail (dot) com, or use the contact form in the sidebar to the right. I look forward to reading them! 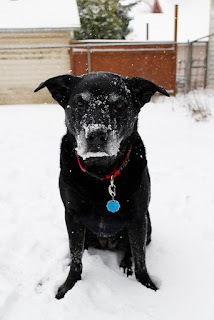 Ellie (who is not the dog in my poem) invites you to leave a direct link to your post in the comments along with a short description. I will list them below. 1. Laura Shovan shares her fascination with an uncovered skeleton, a childhood memory of a hurricane, and a storm-inspired poem by Sid Gold at AUTHOR AMOK. 2. Jama Rattigan has sweets for the sweet this week at ALPHABET SOUP: a Marie Antoinette poem by Christie Grimes and a little gallery of wedding cakes. 3. Laura Purdie Salas is in with a nature-inspired riddle-ku at WRITING THE WORLD FOR KIDS. 4. Irene Latham shares a "poetry potpourri" at LIVE YOUR POEM...: a Gwendolyn Brooks poem, a little Einstein, what she's been reading... and more. 5. At RANDOM NOODLING, Diane Mayr has an original a poem inspired by living alone with an active imagination and a cat. And at KURIOUS KITTY'S KURIO KABINET, a poem by Lisa Williams about grackles, called–what else?–"Grackles." 6. In celebration of Grandparents Day last weekend, CBHANEK shares a touching story about a little girl, a grandma, and a poem you'll recognize about a tree. Also, don't miss her ME poem in response to Lee Bennett Hopkins' challenge HERE. 7. Matt Forrest Esenwine has a bit of everything, including a new poem, a new anthology, and a new CYBILS category he'll be judging, over at RADIO, RHYTHM & RHYME. 8. Linda Baie has a lovely original poem infused with ocean memories at TEACHERDANCE. 9. At A TEACHING LIFE, Tara Smith shares a sigh-worthy poem about the end of summer: "Solitudes" by Margaret Gibson. 10. At A READING YEAR, Mary Lee Hahn's inspirational poem, "To My Students," uses the form Tabatha Yeatts introduced to us a couple weeks ago with the video of Lennon and Maisy. 11. Donna Smith is also sharing an original poem today at MAINELY WRITE. "Aquasphere" is a poem she didn't end up using for SPARK, but here, she illustrates it herself with her new passion for watercolors. 12. Iphigene's heartwrenching original poem at GATHERING BOOKS references three Emily Dickinson poems as it explores a child's coma and a mother's choice. 13. Delighted to see Carol Varsalona is sharing a ME poem at BEYOND LITERACY LINK. She contrasts her childhood seaside memories with a another original poem titled "Summer Splashings." If you haven't yet checked out Carol's extensive Summer Splashings Gallery (unveiled last weekend), you can do so HERE. 14. At HATBOOKS, Holly Thompson writes about a life-changing moment from her late teen years that pointed her toward Japan–thanks to a pair of geta. 15. Amy Ludwig VanDerwater shares an original poem about change and memories at THE POEM FARM, along with the book and life happenings that inspired it. 16. Tabatha Yeatts has got mindfulness on her mind. She shares "Admit Something" by Hafiz at THE OPPOSITE OF INDIFFERENCE. 17. Heidi Mordhorst has some happy news to share, including a momentous event in Room 203. She commemorates the occasion with an original poem at MY JUICY LITTLE UNIVERSE. 18. SALLY MURPHY is in this week with a poem she wrote about bird watching and walking. 19. Do you know the difference between a box turtle and a snapping turtle? You will after reading Ruth's original poetry offering today at THERE IS NO SUCH THING AS A GOD-FORSAKEN TOWN. 20. Doraine Bennett shares a poem about talking with light by Thomas Aquinas and her own beauty of a ME poem at DORI READS. 21. Catherine at READING TO THE CORE, has been searching for just the right form for her campfire poem. She found it, thanks to Eve Merriam. 22. Penny Parker Klostermann has a yummy collaboration from guests, Sandy Lowe and her granddaughter, Mary, on A GREAT NEPHEW AND A GREAT AUNT. 23. Poets and Doctor Who fans will appreciate this lyrical quotation shared by Little Willow at BILDUNGSROMAN. 24. VIOLET NESDOLY offers a poetic tribute to the founder of her local poetry club: "This is the house that Donna built." 25. Anastasia Suen shares the rhyming picture book, Goodnight Football, on her new WRITING LESSONS blog. 26. Sylvia Vardell is "reverse engineering" The Poetry Friday Anthology for Celebrations. At POETRY FOR CHILDREN, she shows how you can ignore the holidays component and use the book to find poems to match with 156 favorite contemporary picture books for story times and lessons. 27. Janet Squires has a review of Fold Me A Poem by Kristine O'Connell George at ALL ABOUT THE BOOKS. 28. Tricia Stohr-Hunt shares some great consignment shop finds at THE MISS RUMPHIUS EFFECT: books by Elizabeth Spires and Myra Cohn Livingston. 30. KAREN EDMISTEN is giving us a taste of autumn this week with Arthur Sze's beautiful and poignant "The Shapes of Leaves." 31. Last, but never least, Margaret Simon has been spending the day completing a Dot Day project with her students. Enjoy their collaborative poem on video at REFLECTIONS ON THE TECHE. Thank you for all of your kind comments today, and especially to those of you who shared your own harrowing dog encounters. Just to set the record straight, while I have moved on from the incident and hold no grudges, sweet Ellie is not mine. (I borrowed her from Flickr Creative Commons.) I'm more of a cat person. See you next week for the DMC Wrap-Up Celebration! That's a scary memory, Michelle. I'm glad you made peace with dogs! I wrote about a childhood memory of a hurricane in my post, but the stormy poem I'm sharing is by Sid Gold. "Clear Intents" is about uprooted trees and reminded me of a news story I read this week. A medieval skeleton was discovered when an old tree was uprooted in Ireland. Quite an image. Oh, Michelle - no wonder that was a moment you can't forget. As Laura said, glad you didn't let that experience keep you from making friends with other dogs. Thanks for stopping by to say hello, Robyn! I confess, I'm still a bit skittish around German Shepherds, but there's too much doggy goodness out there to stay mad for long. I'm glad that scary experience didn't put you off dogs for the rest of your life. My link goes live at 6 a.m. EDT. Thanks for hosting! Can't believe how fast September has flown by. I can't believe it either, Jama! It's a conspiracy, I tell you. By the way, I love the photo of Ellie and I'm glad you weren't scarred for life by your earlier encounter with the "dear dog." I don't think you need to go back to the drawing board, Diane... unless you really want to. I'll email you. Greetings, Michelle! Thank you for hosting Poetry Friday, and for sharing your childhood memory poem. Scary stuff to read about; I can only imagine what it was like for you (re)living it! Thank God you're canine-OK as others have said. In celebration of the most recent Grandparents Day, the post shares thoughts about a Grandma who sent her first grade Grandbaby to school with a poem in her pocket—a poem the little girl lost, a poem she described as being about a man who wrote poems, a tree—and at the end, something about God. Thank you for everything you do to promote poetry! God bless you. When I was in 7 grade, I was walking home the back way when two dobermans sneaked through a hole in their fence and I came face-to-face with the most snarling, vicious creatures I'd ever seen. I slowly backed up, yelling at them to hopefully confuse them - which worked. Once I was safely out of their sight I ran home - a good mile or so - and collapsed on the porch. Needless to say, my folks were NOT happy with the owner! So I can totally identify with your poem...good to see you made it safely through, too! That does sound scary, Matt! Goodonya for having your wits about you and backing up slowly rather than inviting a chase. Actually Ellie is not mine, Linda. I'm more of a cat person. But who can resist that snowy snout? A vindictive Shetland pony? That's a story I need to hear, Mary Lee! Having taught for a bazillion years, I've seen plenty of scars on the faces of children bitten by dogs. Years ago, for no reason, our dog attacked our son (who turned just in time and was alright). I was right there, fortunately, grabbed the dog and called my husband. That was the dog's last day. I love dogs, but I NEVER totally trust them. They are dogs. So that said...glad all worked out for you and the dog in the poem! My original poem today is "Aquasphere" - a response that I didn't use for Spark. I illustrated it myself using... my new passion... watercolors! That's where I'm at with dogs too, Donna. While I've met plenty of mild-mannered sweeties, I'm never completely at ease and the barking sets me on edge. I used to take all the detours I could to avoid dogs when I was a child, now I own 3. I like the idea of the ME poem. I might do something like this soon. Today's I share a poem that references on 3 Emily Dickinson poems as it explored a child's coma and a mother's choice. Michelle, you took me by surprise with your "me" poem. It reminded me of the fear of dogs I had when I was little because one was so mean, loud, and always had to be all over me. Biting was his habit of choice. Thankfully, I recovered from that experience when I grew older. My offering for today's Poetry Friday and Your Little Ditty is Seaside Memories at http://goo.gl/IIJYkM. Oh, Michelle, this reminds me of the time my sister and I had some trouble getting past a collie. Scary! I love all of those little details, especially "the swish of my pants." Over at The Poem Farm I have a poem about change and memories along with the book and life happenings that inspired it. Hi Michelle! Thanks for hosting! I was bitten by a dog on my eyelid when I was young -- isn't that a strange place to be bit? Glad that both of us are still dog-friendly. Yep, seems a bit strange to me, but maybe not to Donna (see her comment above). My original poem talked about where the dog bit me, but my daughter was not at all happy with that information going public. Ha! Another poem for another day! Mine was a German Shepherd as well, Sally. My best guess was that I was about 7 or 8. I really love your poem, Michelle--it has all the clues but no straightforward storytelling--my favorite kind of mystery. Your refrain contains the decision point for this me-defining event and gives readers THREE chances to consider the implications of the decision. Really terrific! and thanks for hosting. I think perhaps we will write ME poems this morning...why wait? I think that sounds like a most excellent idea, Heidi! My sister had a similar dog incident, Michelle. Very scary and your poem captures it in such a creative way. Today on A Great Nephew and a Great Aunt I have a yummy collaboration from guests, Sandy Lowe and her granddaughter, Mary. Thanks for hosting, Michelle, and sharing that shivery "ouch" poem with us. A scary story, without being gory! Love this line: "and I wasn’t so tasty." I'm sharing Goodnight Football, a rhyming picture book on my new WRITING LESSONS blog. Anastasia, I cannot figure out where the comment link is on your page! Help! I'm feeling dense. I've obviously not looked everywhere...but I feel like I have! My selection is "Fold Me A Poem" by Kristine O'Connell George with illustrations by Lauren Stringer. I love your Dear Dog poem. It's a terrific example for Lee's challenge. Today I'm sharing a few poem from two books I found in a consignment shop. The DMC challenges miss you too, Jone! But no pressure... I know how busy life can get. Oops! I don't think my original comment went through. I'm in this week with Arthur Sze's "The Shapes of Leaves." It's beautiful and a bit sad, but so evocative of autumn. The link is here. Thanks for hosting, Michelle! As someone who walked many extra blocks to avoid scary dogs as a child, I could relate to your poem. You certainly brought that fear to life! (Happy to say that now I have all the dog love and none of the fear.) Happy P.F. Thanks for stopping by, Buffy. :) I confess, I still have some fear when it comes to large dogs, and German shepherds in particular, but I always do try to give them the benefit of the doubt. "The day I took the shortcut"...we woke a sleeping rattlesnake! Someday I'll have to tell you this story, Michelle! But are you as brave with rattlesnakes? How long will I have to wait for this story??? Just read through all the posts. It's the first time in a long time that I've done that! Thanks for hosting, and what a great collection of poems this week!